When you train a DofE team in the worst rain, wind and cold that Dartmoor can deliver, it is almost inevitable that, when it comes to their actual expedition (4 days and 3 nights for Gold) they will find themselves in the throes of, that rare phenomenon, a Dartmoor heatwave. Looking back, most of our Gold expeditions have followed the same pattern, our teams (all successful) have melted on the Isle of Man, nearly expired on Exmoor and dripped with sweat on Dartmoor. When the weather is that hot and dry, the provision and consumption of water definitely becomes the hot topic of the day. Expedition success in hot weather, depends on good levels of hydration, and both dehydration and heat stroke are very dangerous. Good planning and training play a huge part in helping youngsters to get ensure they always have drinkable water available and consume regularly. The amounts required to remain hydrated vary from person to person and the question, ‘How much water do I need to drink?’ is a tricky one to answer. What doesn’t change however is that we almost always underestimate the amount of water we are going to need. 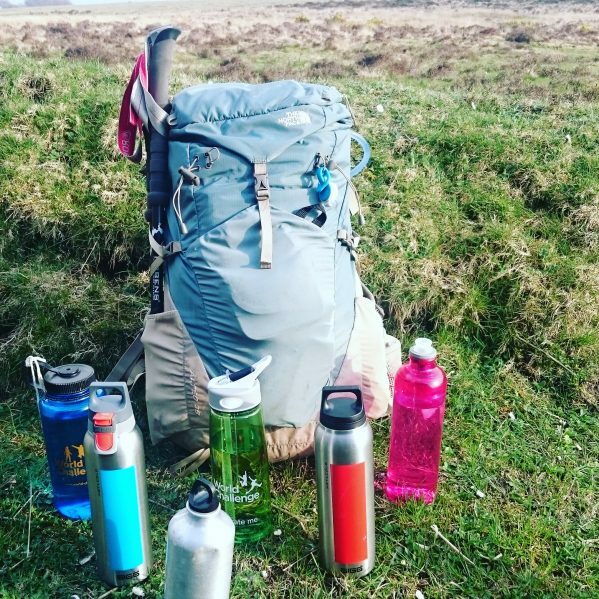 If we require 2 litres of fluids during a normal day, it makes sense that we are going to need a lot more than that to stay hydrated when hill walking with a heavy bag in hot weather. Here are our top tips on staying hydrated while you get outside. This sounds like an obvious one but you would be surprised how many people think they are carrying 2 litres of water when they are only carrying 1 or even less. Take these lovely Sigg bottles for example, you would imagine that we have 2 litres there but each bottle only actually contains 600 ml. Invest in bottles with volume labels (the one on the right has, well done Sigg) and do the maths! Aim for at least 3 litres to start with on a hot day and plan a route to include access to fresh water. 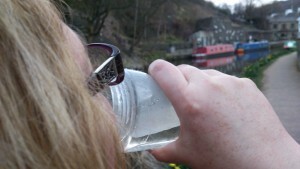 Although we wouldn’t recommend drinking water from the Rochdale Canal (this was extreme water filter testing) it is really important to keep drinking regularly and to know how much water you have drunk. Water bladders with tubes are great for keeping you drinking because you don’t have to stop to do so, but they can allow you to fool yourself into thinking that you have drunk more than you have and they can also unexpectedly run out. 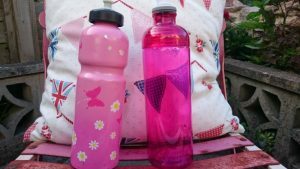 Metal water bottles are strong and will survive drops (they also make good hot water bottles) but these too can disguise the amount of water drunk. Make a point of stopping regularly to check your water supply, that way you will know when to fill up and when to drink up! 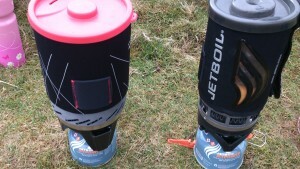 Water containers can break (especially water bladders) or get lost. If water is the thing that is going to keep you going, it makes no sense whatsoever to put all of it in one basket (that was a metaphor, baskets have holes). The other advantage of having more than one water container is that, should you need to use purification tablets, you can have one container sterilising (it takes around 20 minutes) and drink from the other. At no point should you be without water that you can safely drink. (Yes that is a hair dryer in the water bladder picture above). Water purification tablets can get you out of a tricky situation if you run out of fresh water so make a point of carrying some in your emergency kit. They take time to work so don’t wait until you have run out of water completely and make sure that you check the use by date and volume specifications for the tablets you are carrying. They are easy to use but can result in unpleasant tasting water, if you are put off drinking sterilised water by the taste carry one of the small squirty pots of squash that are available from most supermarkets. If you don’t have purification tablets, carrying a stove and boiling water can make it safer to drink than it was before. Bring the water to the boil and watch it do a rolling boil for a few minutes before you let it cool and then decant it. It is worth mentioning here that there are water toxins that neither sterilisation nor boiling will remove, fresh water is best if you can carry enough but don’t let yourself get thirsty. There are more and more water refill stations appearing across the UK and you might be able to plan a route that includes some. There are people out there who will tell you that you will never be short of water out on the UK hills and will even advise not carrying any. This is dangerous advice and misleading. 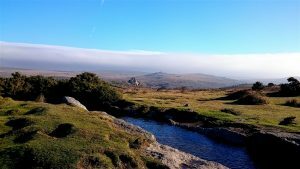 Take Dartmoor as an example, it is criss-crossed with waterways but it isn’t always possible to tell from a map whether or not these will be suitable for drinking water. 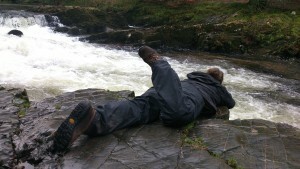 You should only take water to drink from fast flowing water but, although Ordnance Survey are good, that little blue line on the map won’t necessarily give you the information you need as you plan your route. The other things that maps don’t always tell you is how safe it is going to be to get water from a specific location. Making sure that you have enough safe drinking water when you are outside at any time is important, when you are out in hot weather, it can make the difference between a safe expedition and an unsafe one. Drink regularly, refill regularly and enjoy the sunshine! PS We haven’t included the use of water filters in this blog but there are some great ones available if you don’t mind carrying them and doing a lot of pumping.